Home / Learning Centre / Are My Cats Playing or Fighting? Pay attention to your cats’ body language and the sounds they make when playing with each other. A pair or group of cats that are play-fighting will often take turns being the aggressor. If you spot too many instances of one cat being overly dominant, it may be time to intervene. Are your cats hissing or growling? Innocent play-fighting is not usually accompanied by any cat vocalisations. The odd meow now and then is normal, but if your cats are loudly hissing or growling repeatedly they’re trying to let their playmate know they’re not up for this kind of tussle. Are your cats’ ears turned back or positioned against their head? While a cat’s ears may be slightly back during a play fight, in a real bout they will position them as far back as possible to avoid injury. If your kitty’s ears are pulled back against their head it’s reasonable to determine that the feline fight is for real. Are your cats’ claws out? Playful pudda claws are generally sheathed or retracted or at the least, not being actively used as weapons in the cat battle. If your cat is intentionally causing another cat or fur sibling harm with their claws then chances are they’re fighting for the title. Are your cats biting strongly? Any cat lover worth their weight in hairballs knows the difference between a feline love-bite and an angry cat bite. If your cat’s biting behaviour causes harm to their opponent then the feline fight has just moved into dangerous territory. Is your cats’ hair raised or puffed up? No, that’s not static electricity. Your cat’s hair will stand on end in a real conflict situation. A puffed out cat tail and raised back hair during a wrestle with their fur sibling is a likely sign of aggressive cat behaviour. Once you confirm that your cats are no longer putting on a play fight, it’s time to stop the moggy madness before someone gets hurt. There a few dos and don’ts to calling time on your fur babies’ fight to make sure you don’t get stuck in the middle of the match. After any cat conflict it’s important to check your cats for injury and treat as needed. Just like hoomans, cats will occasionally have conflict in their life, but if it is happening regularly with your fur babies, it’s a good idea to do some positive association training to help them heal the rift. 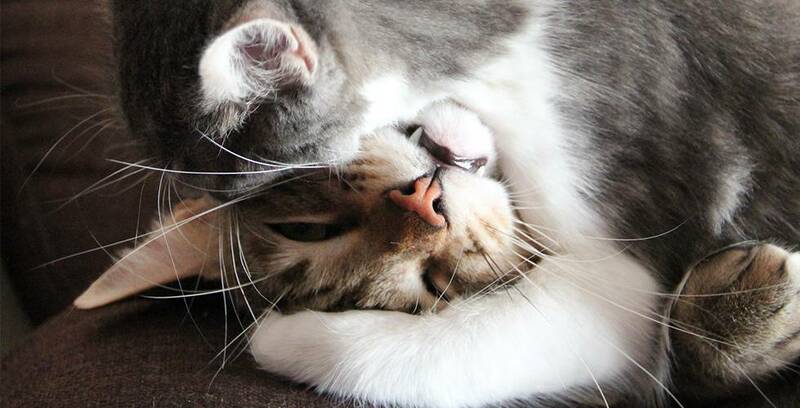 Once your cats have calmed, follow our guide to preventing cat fights in the fur-mily here. If you are about to bring home a new fur baby and you are worried about how your cat will react, have a peek at our guide to kitty cat introductions here.